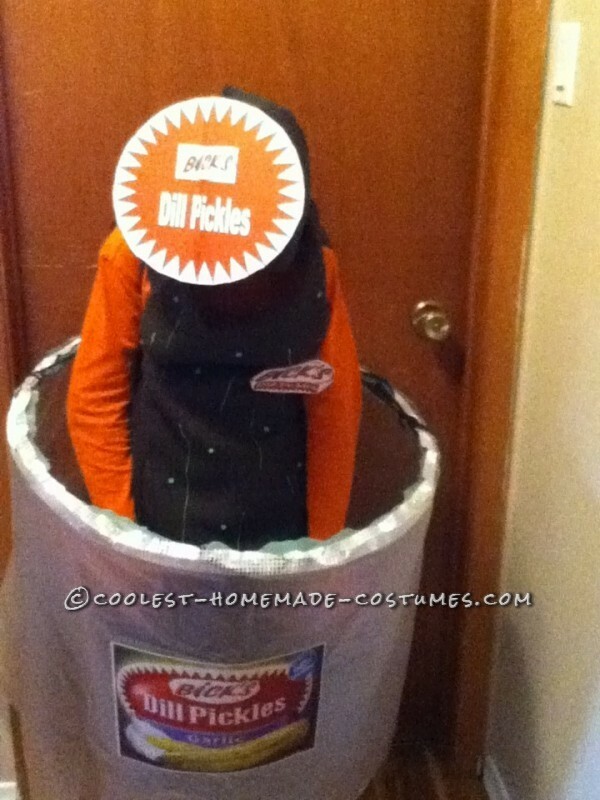 My son wanted to be a pickle in a jar this year for Halloween. The jar was very simple to make. A hoolahoop, clear shower curtain, full sheet labels printed with pickle nutrition info and logo, hot glue, ribbon for trim of “jar” and some green yarn to hold/hang it in place. The pickle was a little more difficult as it involved sewing without a pattern. I can get by with basic sewing techniques but I am not a professional seamstress by any means. 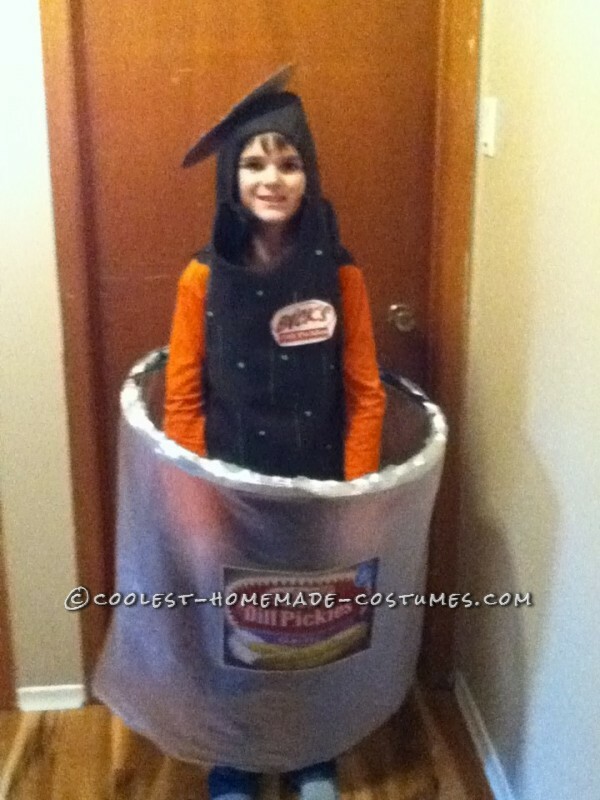 I used dark green fleece fabric (for child size costume). Cut the fabric in panels tapered for the “hood” and slightly pointed at the front bottom panel only (for a pickle like look). Sew panels and top together. Cut out arm and face holes. I painted lines and dots along the front and back of the costume to immitate the bumps and shadows of a pickle with black and green glow in the dark fabric paint. I printed two pickle logos on labels and stuck them on a scrap piece of cardboard. The larger label was then secured with a safety pin on the hood on a slant as “the lid of the jar” and a smaller label was pinned on the front (optional). 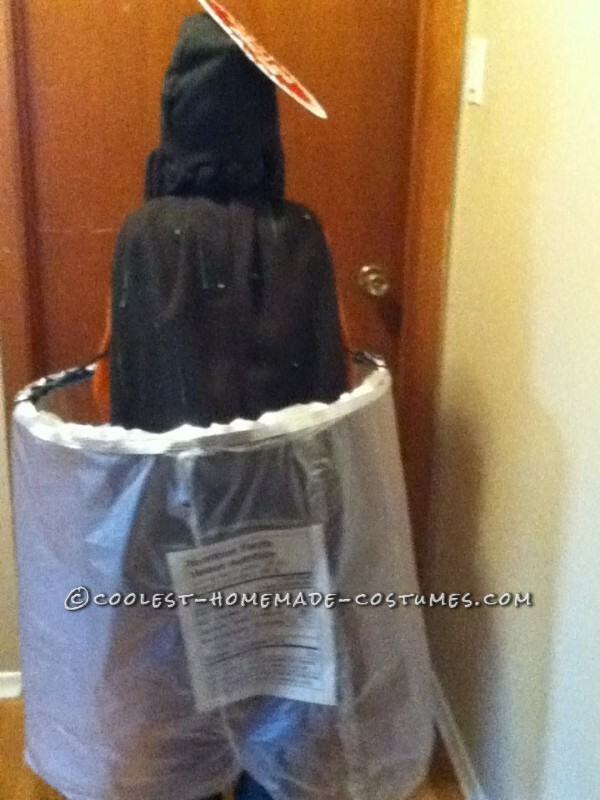 Very original costume to say the least.